Tanks were first used at the Battle of Flers-Courcelette on September 15th 1916 after which they ceased to be a military secret. They immediately captured the public imagination. The government was keen to sell War Bonds (a short-term, low interest way of raising cash and involving the civil population with the army and navy) and someone had the bright idea of sending 'Tank Banks' to towns where they could quickly draw a large, curious crowd. 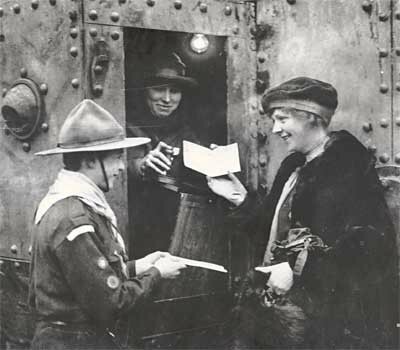 These tanks usually had attractive young women sitting in them, ready to sell War Bonds! 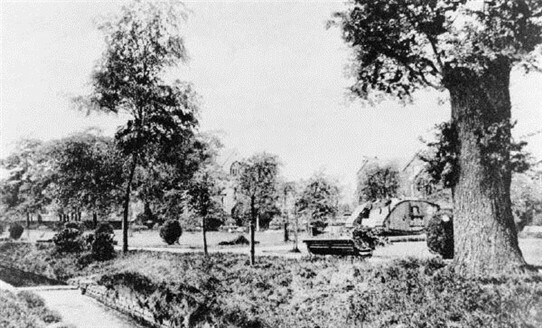 When peace came some surplus tanks were presented to places which had bought particularly large quantities of the bonds, one of which was Mansfield. 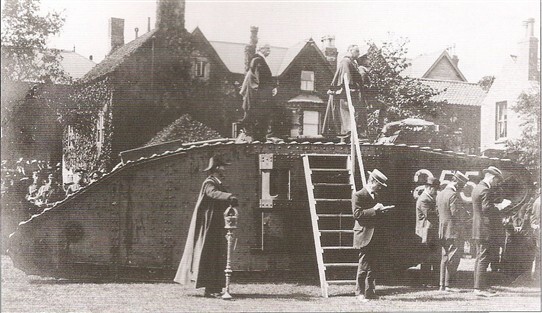 'The Mansfield Tank' arrived on 21 May 1919 and was placed in Titchfield Park with due ceremony. It was a Mark I 'female', i.e. originally armed with machine guns, as opposed to the cannon-armed 'male' tanks. 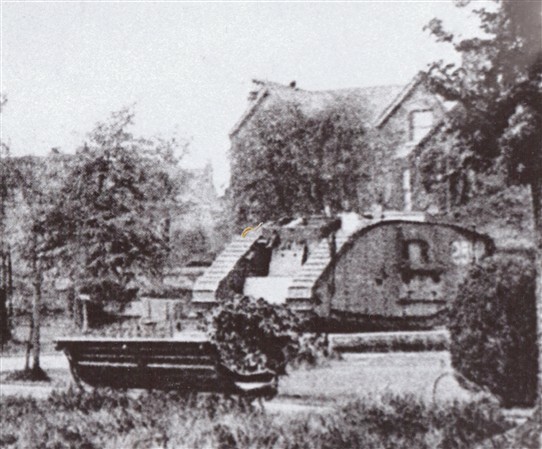 Photographs show that it had the number 255 painted on its sides, but it had only been a training tank, never in combat (unlike the Newark Mark IV which was a real veteran of battles). No. 255 then stood in the park throughout the 1920s and must have provided great climbing games for adventurous children. It may also have been of interest to the Chesterfield Road grocer William 'Billy' Foster who had fought at Flers-Courcelette and was one of the first tank crewmen ever [see his story in detail under Notts Servicemen in the Great War E - F surnames on this site]. The Mansfield Tank was taken away for scrap in the 1930s; in fact none of those presented to British towns survived the emergency need for metal during the 1939 - '45 War. The Mayor, Frank Hardy, is making a welcoming speech from the top of it.